Submitted by Spirit from JSU Spirit from Jacksonville State University recorded one of its most successful camps to date over the Feb. 2-4 weekend. For the first time in many years, the corps learned drill in February and put more than a full minute of the opener on the field. The horns and drums were also very busy musically, with the horn line playing through the entire first movement of the show and working as an ensemble with the drums playing nearly two minutes of this segment. 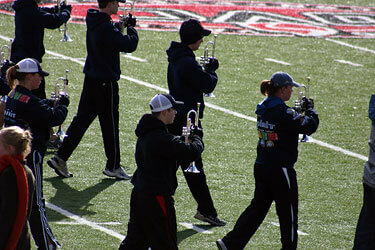 Spirit from JSU took full advantage of the seasonal Alabama wintertime to work outdoors on drill and marching basics. "The talent and work ethic is truly amazing and we feel like the corps is simply picking up from where we left off last season," said Spirit from JSU Director Ken Bodiford. "With more than an 80 percent return rate in both the horn line and drum line, the announcement of Spirit as a Pearl/King corps and the new direction of the guard program under George Armenta, we are looking forward to one of Spirit's most competitive seasons to date." Also exciting was the unveiling Saturday evening of Spirit's new uniform. It represents the first new uniform in several years for the corps and the new look for the future of Spirit. 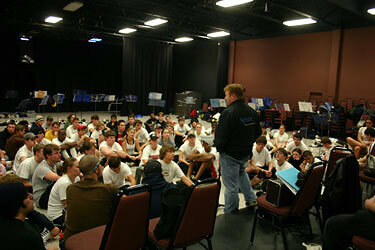 during a February music rehearsal.